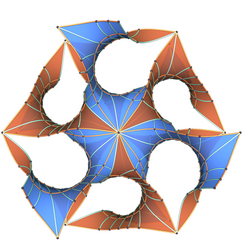 This page contains a rotatable model of the gyroid minimal surface. The first applet shows a translational fundamental domain. Loading sample geometry. The second applet shows several pieces of a fundamental domain forming a larger piece of the gyroid. Loading sample geometry. These applets were created using Mathematica 8.0, the mesh package from Matthias Weber, and JavaView.